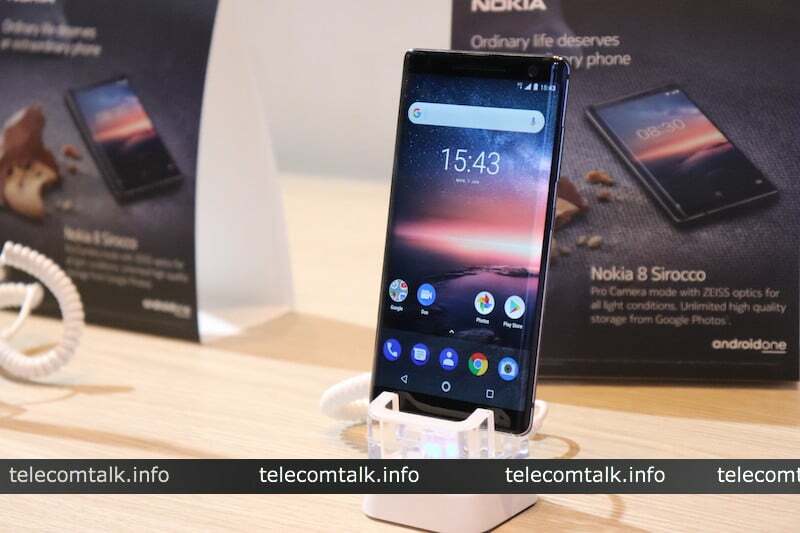 Bharti Airtel today announced that three 2018 Nokia smartphones, the Nokia 7 Plus, Nokia 6.1 and Nokia 8 Sirocco would be available for purchase from Airtel Online Store with down payment option starting at Rs 3,799. This offer is valid only for Airtel postpaid users as the telco bundles free postpaid plan with all the three smartphones. The down payment for the devices start at Rs 3,799 and goes up to Rs 8,599. Users interested in picking up the Nokia 6.1’s 3GB RAM variant has to make a down payment of Rs 3,799 and 12-month EMI period will be applicable where the customer has to pay Rs 1,499 every month. The user must be on the Airtel postpaid network as the telco will be offering 30GB of data with rollover option, unlimited voice calls including roaming calls and free Airtel TV subscription for the entire EMI period. For the Nokia 6.1 4GB RAM variant, users have to make a down payment of Rs 5,799 and the same Rs 1,499 for the next 12 months. Coming to the Nokia 7 Plus, interested customers can pick the device from the Airtel Online Store by paying Rs 5,599 up front and Rs 2,099 as EMI every month for 12 months. The same postpaid plan benefits of 30GB data per month and unlimited voice calls is applicable for the Nokia 7 Plus too. Lastly, we have the Nokia 8 Sirocco smartphone which can be purchased at Rs 8,599 down payment amount and Rs 2,799 EMI every month for 18 months. Airtel will be offering 50GB of free data, one-year Amazon Prime membership, Airtel Secure Device protection, unlimited voice calling and free Airtel TV subscription during the EMI period. For the unaware, the Nokia 6.1 3GB RAM variant is priced at Rs 16,999 and the 4GB RAM variant costs Rs 18,999. The Nokia 7 Plus is retailing for Rs 25,999, while the Nokia 8 Sirocco sets you back by Rs 49,999. If you’re interested in availing Airtel’s new offer on Nokia smartphones, head over to www.airtel.in/onlinestore and get the device by making the respected down payment. The device will be delivered to customer’s preferred location/address. Airtel also partnered with HDFC Bank, Federal Bank, Clix Capital and Seynse Technologies to enhance the digital experience on its Online Store. Also, do make a note that the free Airtel TV subscription will be valid only until December 31, 2018. ?I am yet to understand customer benefit in this offer.? Most of the Customer who uses Postpaid plan, usually have Credit Card where this phone is already available with No Cost EMI or can Purchase Bajaj FinServ EMI card for 412/-, then why to bundle Airtel plan for one complete year?? Benefit to zero is nil. But if airtel can get the commission on sale of these phones that would otherwise go to the shops and store chains, then why would they not do this? It will help their cash flows. Lol, I have not seen any buyer for Nokia 6.1 and Nokia 7 Plus so far in my vicinity!!!!! People aren’t satisfied with camera and pricing of Nokia products on their return to mobile industry!!!!! People are waiting for Zenfone 5 and Mi A2!!!!! Xiaomi Mi Max 3 as well!!!!! I just told what I knew!!!!! People aren’t excited as they were last year!!!!! Nokia 6 gave worst performance to value ratio!!!! !Battery life was terrible too!!!!! Yea , nokia original qualtiy is missing. What people dont understand that this is HMD built devices with just brand licensing from Nokia. None of Nokia employee or designer working..
Actually not even HMD but Foxconn/FIH. Even though performance is vastly improved, camera and battery life remains subpar in my experience!!!!! Correction: benefit to customer is nil.